New number one ticket holder The new Number 1 Ticket Holder Gwen Crimmins spoke about her overwhelming joy to be chosen as the Number 1 Female ticket holder following on from Dulcie Kennedy. 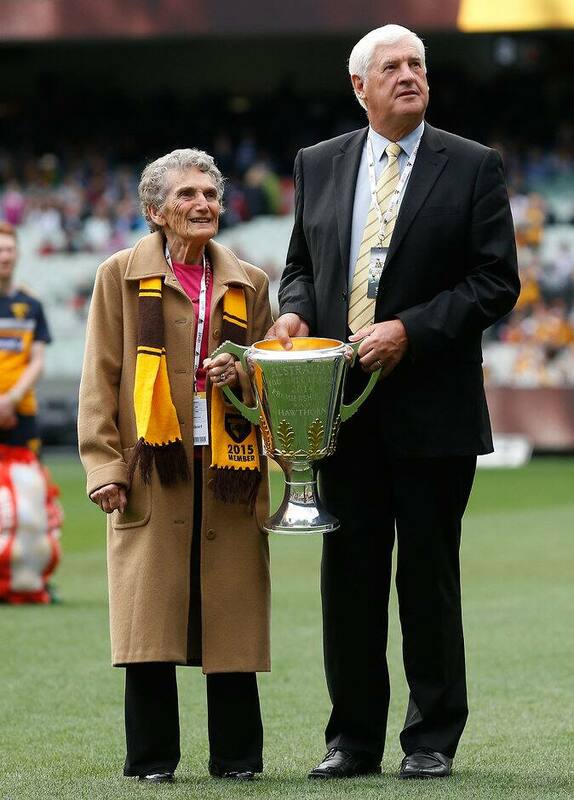 Dulcie Kennedy and Peter Hudson pose with the 2014 premiership cup. Hawthorn Football Club has appointed Gwen Crimmins as its new number one female ticket-holder. Gwen joins club great Peter Hudson as a joint primary ticket holder of the Hawks. She will take over the title from Dulcie Kennedy, wife of John Snr, who has held the position since 2014. Gwen's late husband, Peter Crimmins, was a Hawthorn premiership player and captain of the club for two years. Playing 176 games for the club, Crimmins is regarded as one of Hawthorn’s most iconic figures. Following the Hawk’s victory in the 1976 grand final, the premiership cup became known as "Crimmo's Cup" in honour of Crimmins who tragically lost his battle with cancer just three days after the game. The club best and fairest award has since been named after Crimmins in recognition of his services to the club. While 2017 will mark Gwen Crimmins’ first year in the position, Hudson enters his eleventh year as Hawthorn's male number one ticket holder, having held the position since 2007. Across a nine-year career at Hawthorn, Hudson, who hails from Tasmania, played 129 games for the club and booted 727 goals. The club would like to thank Dulcie Kennedy for her service and commitment over the past three years.